The calculations in question involved both an over-simplification and a set of assumptions which limit their precision, if applied to Earth’s real climate system. They provide a nice idealised and theoretical description, but they should not be interpreted as an accurate reflection of the real world. There are nevertheless some interesting concepts presented in the analysis, such as the connection between climate sensitivity and the magnitude of natural variations. Both are related to feedback mechanisms which can amplify or dampen initial changes, such as the connection between temperature and the albedo associated with sea-ice and snow. Temperature changes are also expected to affect atmospheric vapour concentrations, which in turn affect the temperature through an increased greenhouse effect. Cox et al. assumed that the same feedback mechanisms are involved in both natural variations and a climate change due to increased CO2. This means that we should expect a high climate sensitivity if there are pronounced natural variations. But it is not that simple, as different feedback mechanisms are associated with different time scales. Some are expected to react rapidly, but others associated with the oceans and the carbon cycle may be more sluggish. There could also be tipping points, which would imply a high climate sensitivity. The Hasselmann model is of course a gross simplification of the real climate system, and such a crude analytical framework implies low precision for when the results are transferred to the real world. To demonstrate such lack of precision, we can make a “quick and dirty” evaluation of how well the Hasselmann model fits real data based on forcing from e.g. Crowley (2000) through an ordinary linear regression model. The regression model can be rewritten as , where , , and . In addition, and are the regression coefficients to be estimated, and is a constant noise term (more details in the R-script used to do this demonstration). Figure 1. 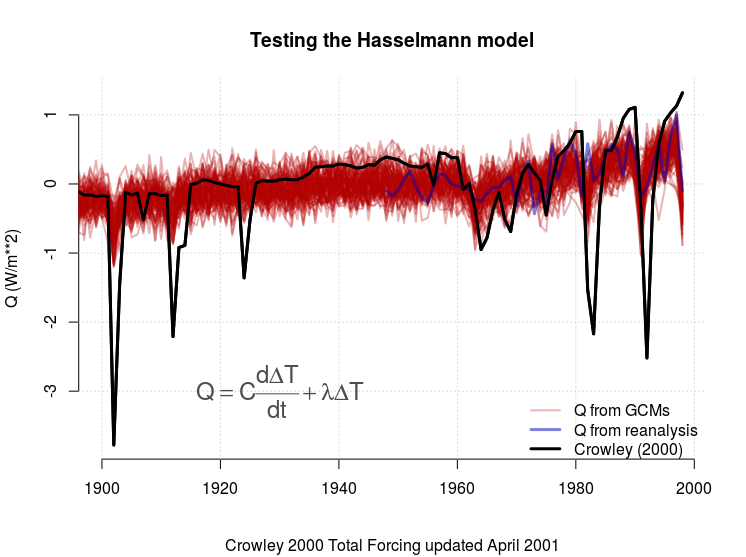 Test of the Hasselmann model through a regression analysis, where the coloured curves are the best-fit modelled values for Q based on the Hasselmann model and global mean temperatures (PDF). It is clear that the model fails for the dips in the forcing connected volcanic eruptions (Figure 1). We also see a substantial scatter in both (some values are even negative and hence unphysical) and (Figure 2). Figure 2. 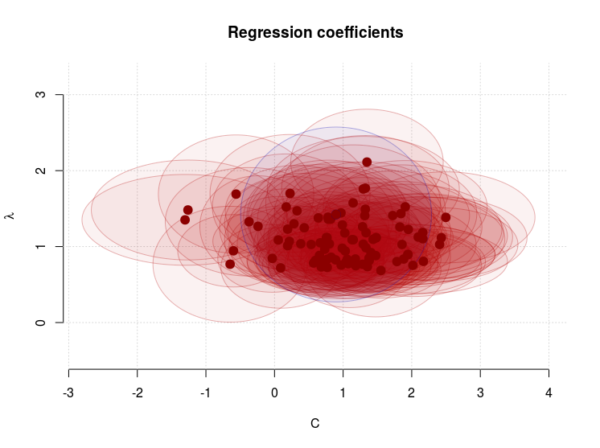 The regression coefficients. Negative values for C are unphysical and suggest that the Hasselmann model is far from perfect. The estimated error margins for C are substantial, however, and also include positive values. Blue point shows the estimates for NCEP/NCAR reanalysis. The shaded areas cover the best estimates plus/minus two standard errors (PDF). The climate sensitivity is closest associated with , for which the mean estimate was 1.11 , with a 5-95-percentile interval of 0.74-1.62 . We can use these estimates in a naive attempt to calculate the temperature response for a stable climate with and a doubled forcing associated with increased CO2. It’s plain mathematics. I took a doubling of 1998 CO2-forcing of 2.43 from Crowley (2000), and used the non-zero terms in the Hasselmann model, . The true equilibrium climate sensitivity for the climate models used in this demonstration is in the range 2.1 – 4.4 , and the transient climate sensitivity is 1.2 – 2.6 (IPCC AR5, Table 8.2). This demonstration suggests that the Hasselmann model underestimates the climate sensitivity and the over-simplified framework on which it is based precludes high precision. Another assumption made in the calculations was that the climate forcing Q looks like a white noise after the removal of the long-term trends. This too is questionable, as there are reasons to think the ocean uptake of heat varies at different time scales and may be influenced by ENSO, the Pacific Decadal Oscillation (PDO), and the Atlantic Multi-decadal Oscillation (AMO). The solar irradiance also has an 11-year cycle component and volcanic eruptions introduce spikes in the forcing (see Figure 1). Cox et al.’s calculations were also based on another assumption somewhat related to different time scales for different feedback mechanisms: a constant “heat capacity” represented by C in the equation above. The real-world “heat capacity” is probably not constant, but I would expect it to change with temperature. Since it reflects the capacity of the climate system to absorb heat, it may be influenced by the planetary albedo (sea-ice and snow) and ice-caps, which respond to temperature changes. Cox et al.’s calculations of the equilibrium climate sensitivity used a key metric which was derived from the Hasselmann model and assumed a constant C: . This key metric would be different if the heat capacity varied with temperature, which subsequently would affect the end-results. I also have an issue with the confidence interval presented for the calculations, which was based on one standard deviation . The interval of represents a 66% probability, and can be illustrated with three numbers: and two of them are “correct” and one “wrong”, which means there is a 1/3 chance that I pick the “wrong” number if I were to randomly pick one of the three. To be fair, the study also stated the 90% confidence interval, but it was not emphasised in the abstract nor in the press-coverage. 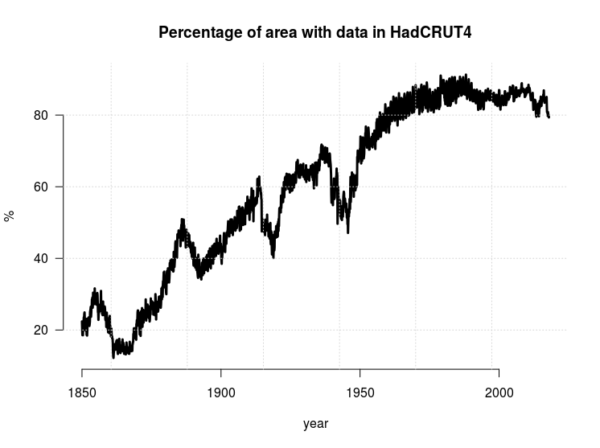 One thing that was not clear, was whether the analysis, that involved both observed temperatures from the HadCRUT4 dataset and global climate models, took into account the fact that the observations do not cover 100% of Earth’s surface (see RC post ‘Mind the Gap!’). A spatial mask would be appropriate to ensure that the climate model simulations provide data for only those regions where observations exists. Moreover, it would have to change over time because the thermometer observations have covered a larger fraction of Earth’s area with time (see Figure 3). An increase in data coverage will affect the estimated variance and one-year autocorrelation associated with the global mean temperature, which also should influence the the metric . Figure 3. The area of Earth’s surface with valid temperature data (PDF). My last issue with the calculations is that the traditional definition of climate sensitivity only takes into account changes in the temperature. However, there is also a possibility that a climate change involves a change in the hydrological cycle. I have explained this possibility in a review of the greenhouse effect (Benestad, 2017), and this possibility would add another term the equation describing the Hasselmann model. James Annan has a new post saying that this post “misses the mark.” Worth a read. which butts up against Peter Cox saying before: “The constant heat capacity C in this model is a simplification that is known to be a poor representation of ocean heat uptake on longer timescales. However, we find that it still offers very useful guidance about global temperature variability on shorter timescales”. So if I, as a plodder, understand you correctly I am thinking that ECS is similar too a ‘theory of everything’ for CO2. Where ‘C and \lambda’ are kind of similar to the speed of light, C in MC2, where C is not actually constant under all circumstances in the real world, but is assumed it is in E=MC2. So what I think you’re saying, in my own words, is that Cox et al has simultaneously made too many incorrect assumptions and over simplified the variability / dynamics involved in the climate system. Therefore their conclusion for ECS is unreliable and unsupported by the known science and their own Math. As a theoretical exercise the work, like all other’s on ECS to date, it has some value and uses, however their ECS range can not be practically applied to the real world for long term T forecasting. iow, the ‘Variability Jury’ is still out on mathematically sound ‘Attribution’ of all aspects of the Climate System? Is that a reasonable take-away message for the average Joe? Meanwhile in the middle of a Weak La Nina cycle, CO2 continues to set new world records for January @ML of ~408ppm, +2ppm above last January. I wanted to thank you all for a scientific discussion with the graciousness and honest clarification, discussion, and evaluation that cannot occur when snipers from the unskeptical “skeptic” universe jump in to undermine the collective wisdom that is real science. I was tempted to say something earlier, but the excellence of the overall discussion was the reason I keep coming back to RealClimate, and having nothing to add, I added nothing. There has to be a tipping point at some point in time because if we see a constant rise in CO2 eventually it will crowd out all other molecules in the atmosphere. We havent seen a tipping point yet and there has been no acceleration in any variable that has been measured and dont refer me to SLR because the accuracy resolution of the satellites is greater than the data output scale. Temperatures in the statopshere have not gone up and the GISS data for troposphere is adjusted ad nauseum. There are no more storms than there ever were. You climate scientists have hoisted the biggest fraud on mankind ever. AT 56: You climate scientists have hoisted the biggest fraud on mankind ever. BPL: If you have evidence of fraud, produce it. If not, STFU. There has to be a tipping point at some point in time because if we see a constant rise in CO2 eventually it will crowd out all other molecules in the atmosphere. Complete nonsense. If all fossil fuels are burned it is estimated that CO2 levels would reach about 5000 ppm. That 0.5% of the atmosphere would hardly be crowding out all other molecules. Regardless, what does this have to do with tipping points or anything for that matter? Nothing. …dont refer me to SLR because the accuracy resolution of the satellites is greater than the data output scale. More nonsense. Satellite accuracy is quite good and well under the observed rise in sea levels. Ask the people of Miami Beach and Micronesia if sea levels have risen. Temperatures in the statopshere have not gone up…. AGW theory predicts that the stratosphere will cool, which is exactly what is observed. …and the GISS data for troposphere is adjusted ad nauseous. And the adjustments are clearly justified. Regardless, the planet is warming as seen by sea level rise (as observed by accurate satellites and tide gauges contrary to your false claim), increased ocean temperatures as measured by the ARGO system, melting glaciers (confirmed by observations and GRACE satellites), longer growing seasons, the migration of species poleward and to higher elevations, melting permafrost, decreasing arctic sea ice, and increased humidity. There are no more storms than there ever were. Not a prediction of AGW theory. Only increased storm strength, which is clearly occurring. You climate scientists have hoisted the biggest fraud on mankind ever. When did this fraud start? Was it Fourier in the 1820s when he first proposed the idea? Perhaps it was Tyndall in 1854 when he measured the radiative properties of atmospheric gases? Arrhenius in 1896 when he predicted the burning of fossil fuels would warm the planet? Maybe it was E. O. Hulbert of the Naval Research Lab in the early 1930s when he added water vapor to the theory? It’s a naval conspiracy perhaps? Maybe Chandler that British steam engineer in the 1930s who first showed the planet was warming. Perhaps it is a British conspiracy? Or how about Plass in 1954 when he wrote on the role of CO2 in climate change? After all, he did work for the military and it could be a military fraud, right? Was Revelle in on it when he showed the oceans couldn’t absorb the excess CO2 in 1956? Scripps Institute of Ocean might have been just a liberal scam, right? Was the President’s Science Advisory Commission in on the conspiracy when they wrote their report in 1965? Manabe in 1967 when he made his first model? Can’t trust those Japs, right? Was the National Academy of Science in on it already in 1979 when they produced the Charney Report on CO2 and climate or their report in 1983 on changing climate? Please tell me when and how this fraud started and how it works. How are the thousands and thousands of scientists who have worked on the problem since the 1820s complicit? Who got them all to toe the line and continue this big fraud for such a long time? If you want to criticize the science and make accusations of fraud, I suggest you learn something about the science and its history before you make your silly claims. Wow, the Dunning-Kruger is strong in this one. CCH (@58): Mind if I post that last big paragraph on FB? I think it’s an excellent takedown of the “it’s a fraud” or “it’s a liberal plot” claims. Thanks! Most certainly. I’d be flattered. I’ve posted this in various forms over the years on blogs inspired by Spencer Weart’s work: The Discovery of Global Warming in response to the conspiracy meme. Sometimes I can even be a bit more snarky. I also attempt to use a brief history of the science when I give talks. Again to let people know that AGW isn’t something just thought up by some new world order in order to gain control of the globe or whatever. The history is powerful IMHO as it helps support the robustness of the science. The name of that British engineer in the 1930s was Guy Stewart Callendar. Thank you for the correction, apparently my memory isn’t working as good as it used to. Gah! In a bizarre misclicking accident, I linked the Arrhenius piece. Thank you for the links, good stuff. I’m particularly enamored by Langley’s work as he was Director of the Allegheny Observatory which is part of the university of my undergraduate degree. He gets a side bar in my presentations in showing early on through measurements of the moon that the CO2 effect is not saturated. However, we do try to forget about his work in aviation. I think BPL would agree. They used to hang the Langley aerodrome in Forbes Quad, but they’ve since moved it somewhere else. Unfortunately I graduated before the Forbes Quad was completed so never got to see the Langley aerodrome. Glad to hear the University actually honored Langley’s work in aviation. Seems history generally judges him harshly for his failed attempts at human flight while ignoring his many accomplishments.